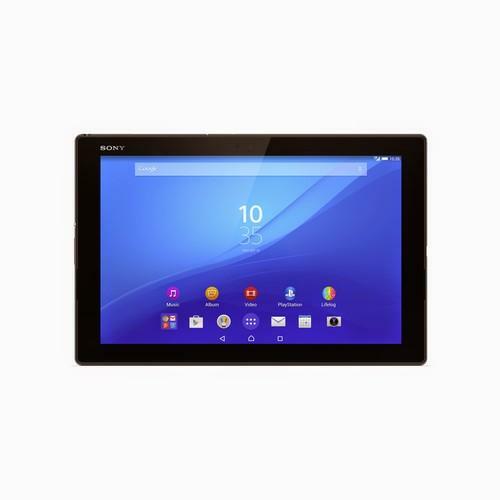 The Xperia Z4 Tablet from Sony weighs from only 389 grams. Unlike HTC and Samsung Electronics, Sony isn't launching a high-end smartphone at Mobile World Congress, but is hoping to make up for that with a new flagship tablet, the Xperia Z4 Tablet. It has a 10.1-inch, 1600 x 2560 pixel screen and is powered by Qualcomm's octa-core Snapdragon 810 processor. The Wi-Fi version weighs 389 grams while the LTE version is slightly heavier at 393 grams, and both are 6.1 millimeters thick. In addition to its svelte looks, the tablet also offers up to 17 hours of video playback with the help of a 6,000mAh battery, according to Sony. However, battery life promises should always be taken with a grain of salt. The Galaxy Tab S 10.5 from Samsung, which will be one of Z4 Tablet's main competitors, has a 7,600mAh battery, but it weighs from 465 grams and is 6.6 millimeters thick. The Tab S has a 10.5-inch screen with the same resolution. The Sony tablet is also lighter than Apple's iPad Air 2, which weighs from 437 grams and is also 6.1 millimeters thick. To get people to buy a new tablet, Sony is also taking a page from its smartphone playbook by improving the cameras. The Z4 Tablet has an 8-megapixel main camera, which Sony promises can take good pictures in low light conditions, as well as a 5-megapixel wide-angle front camera. Last year saw smartphone vendors putting more effort into developing selfie-friendly front cameras, and it seems that development is now spreading to tablets. The Xperia Z4 Tablet is also waterproof and dust-tight. It has 3GB of RAM and 32GB of integrated storage that can be expanded by up to 128GB using an microSD card. It will start shipping globally in June. Pricing wasn't immediately available.